Hello everyone! An indie brand post today which I’m really excited to share with you all and it’s on my new favorite lip products even though I just received them like a week ago. Review: Gloss – These glosses glide on smoothly with fantastic pigmentation and wear for about 2 hours time but I drink a lot of water so most glosses don’t last too long on me. 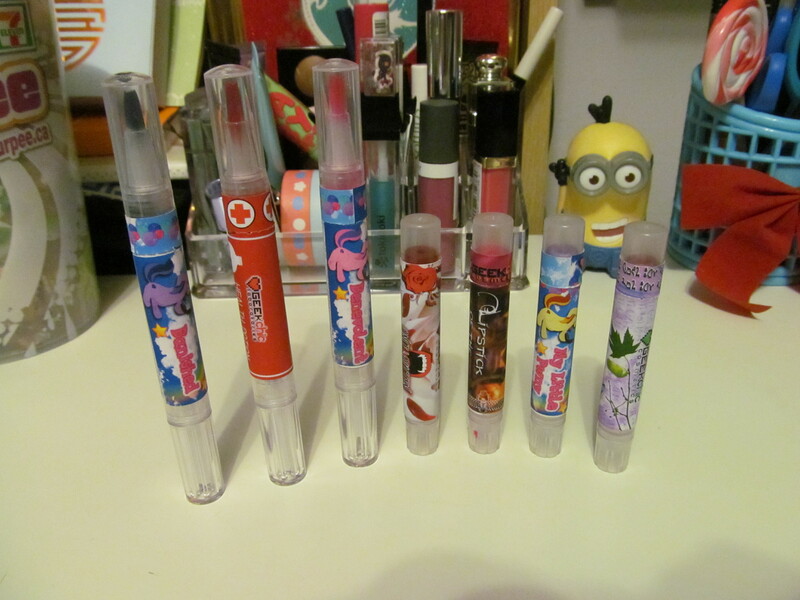 I like that they are a click pen applicator as I can get all the gloss out of the tube and doesn’t the packaging look extremely cute? Banished was a bit hard to work with and I have to gloop it on if I want to get the really dark lip look that contrasts with my skintone. 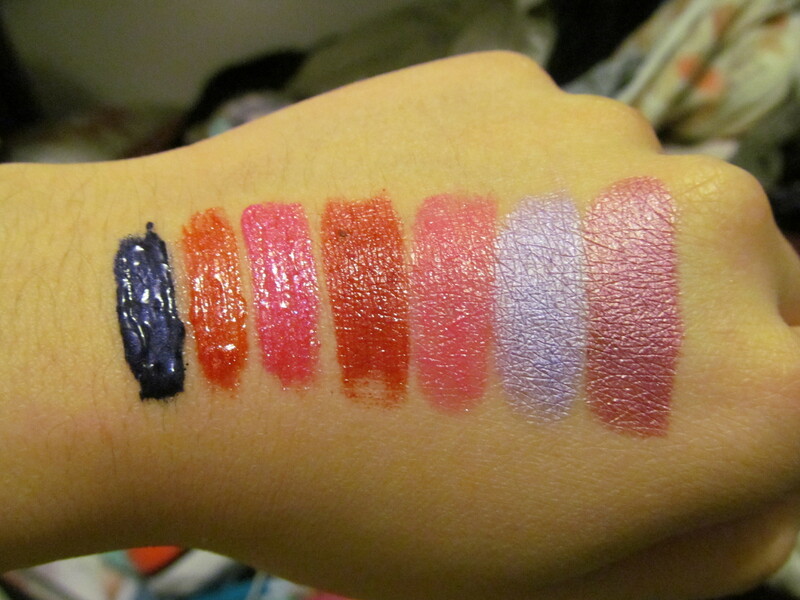 Health Potion and Benevolent have an awesome formula and they are gorgeous everyday shades. Lipsticks – I love all the shades but wear Once Bitten and Lipstick of the Shifting Sands more often than the other two. 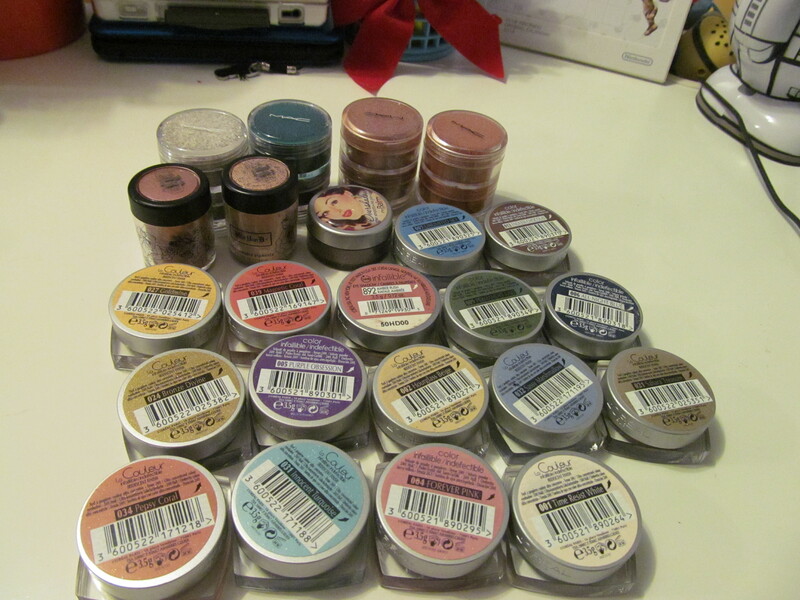 I found it difficult to work with My Little Pwny and Chrysalis due to the amount of shimmers in the product itself. It wasn’t as smooth as Once Bitten and Lipstick of the Shifting Sands but they were a lot longer than the other two. I can get about 2-4 hours from Once Bitten and Lipstick of the Shifting Sands but from My Little Pwny and Chrysalis I got 4-6 hours which is awesome! Would I recommend these products? Yes, yes and yes! These are absolutely amazing and I love the way they feel on the lips and the color selection is amazing. 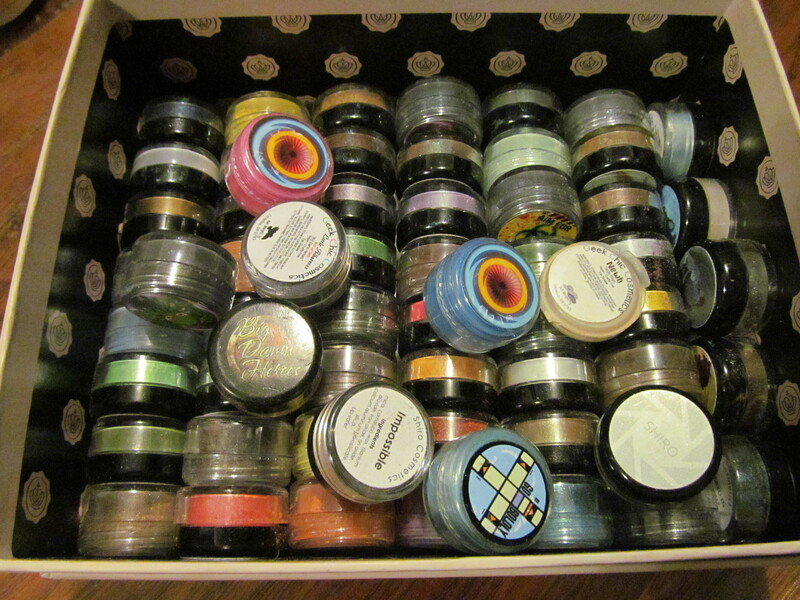 I’ll definately be picking up more shades some time soon! 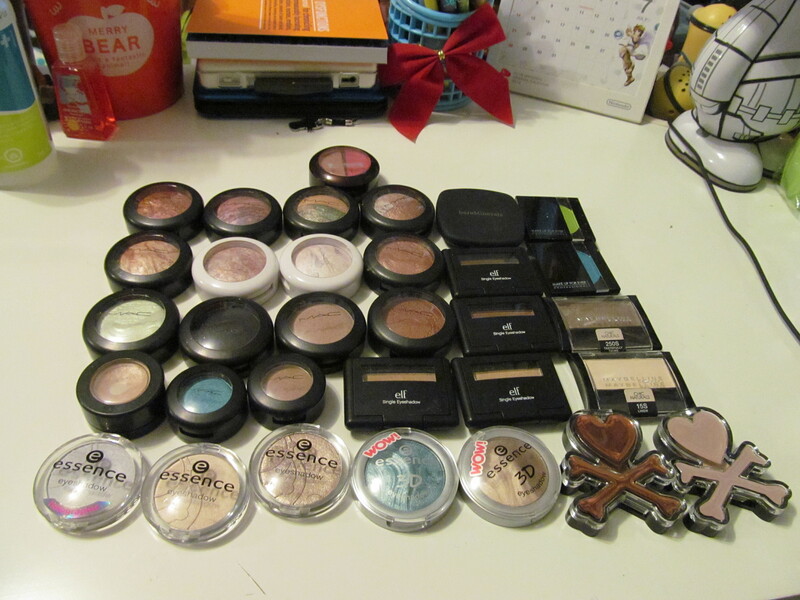 For October I picked up a few things and then went really crazy for makeup in November due to the Black Friday/Cyber Monday sales and got a lots of gifts sets in December. 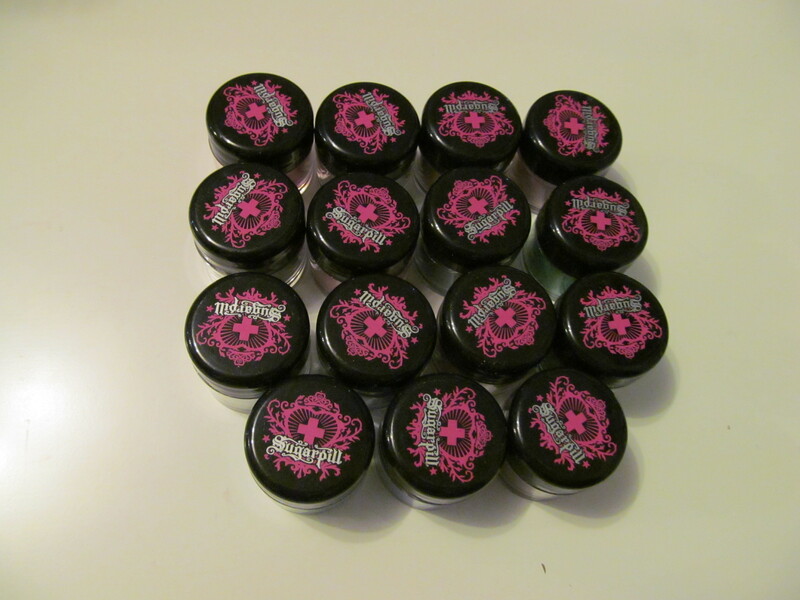 I also made two indie cosmetics orders (Sugarpill + Geek Chic Cosmetics) from Black Friday shopping (hooray for great deals!). So first off I have to say that I have a soft spot for special/unique packaging. 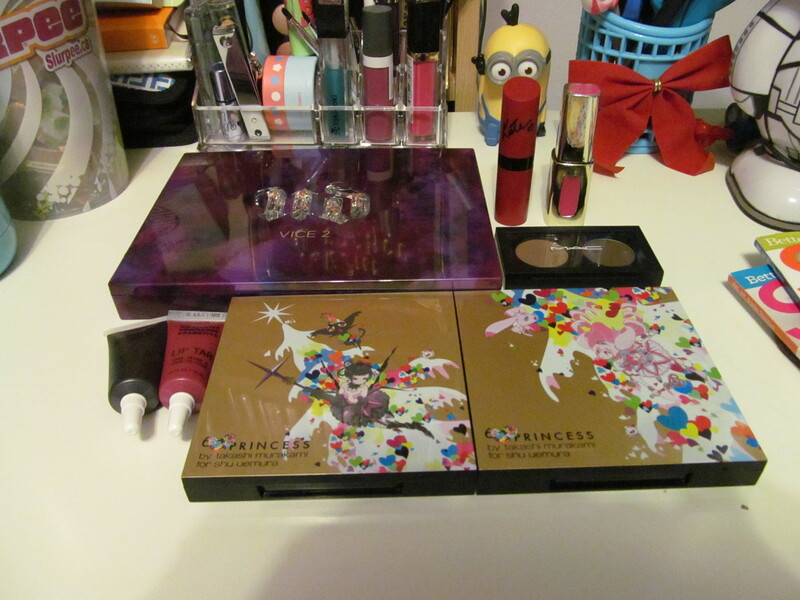 That was one of the main reasons why I picked up the Shu Uemura X Takashi Murakami collaboration palettes. The Canadian prices of these palettes are really inflated ($90CAD) and the colors are dupable but that packaging is to die for. 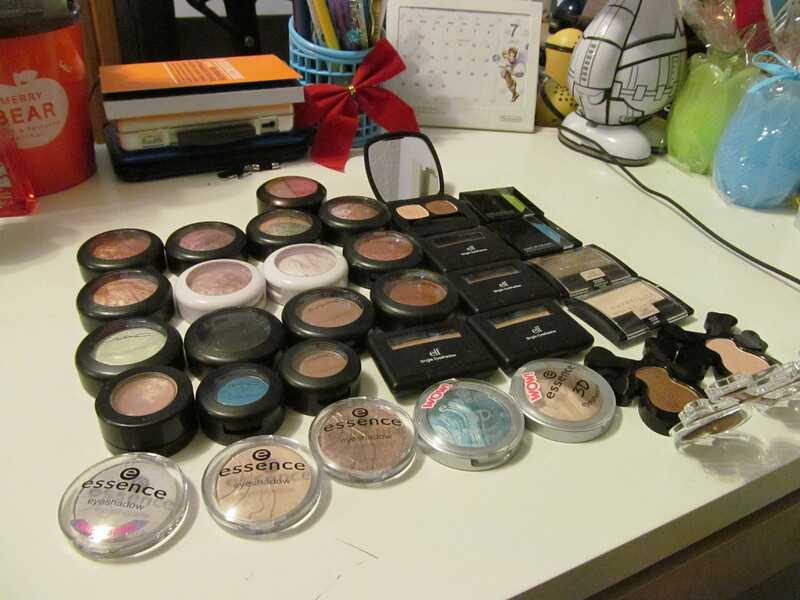 So that makes these two palettes my most expensive makeup items that I own. >.< One of the palettes broke in transit but I got it replaced which was really nice of Shu to do now they are both in pristine condition ready to be used. 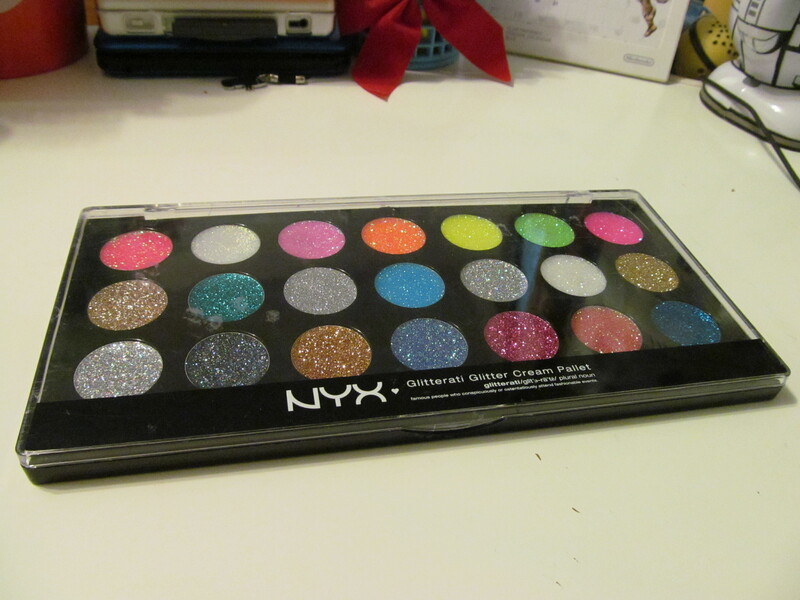 The other things of course is the Vice 2 palette from Urban Decay with it’s gorgeous jewel-tone shades how could I resist? And I have had my eyes on getting more OCC Lip tars to add to my collection and since these are only available online I picked two that are just perfect for the fall/winter times. I used them a couple of times and they are GORGEOUS! If you haven’t tried these lip products go and try them they are amazing! 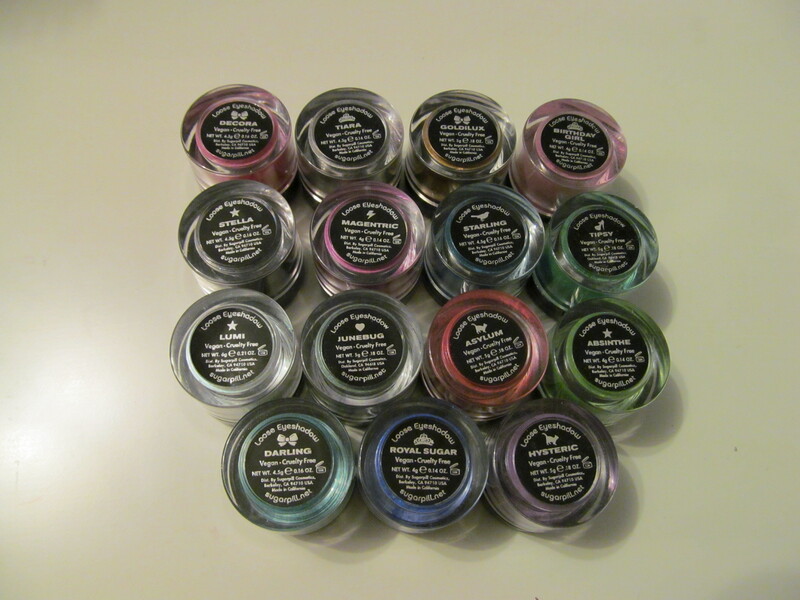 Shades purchased are Strumpet and Black Dahlia. 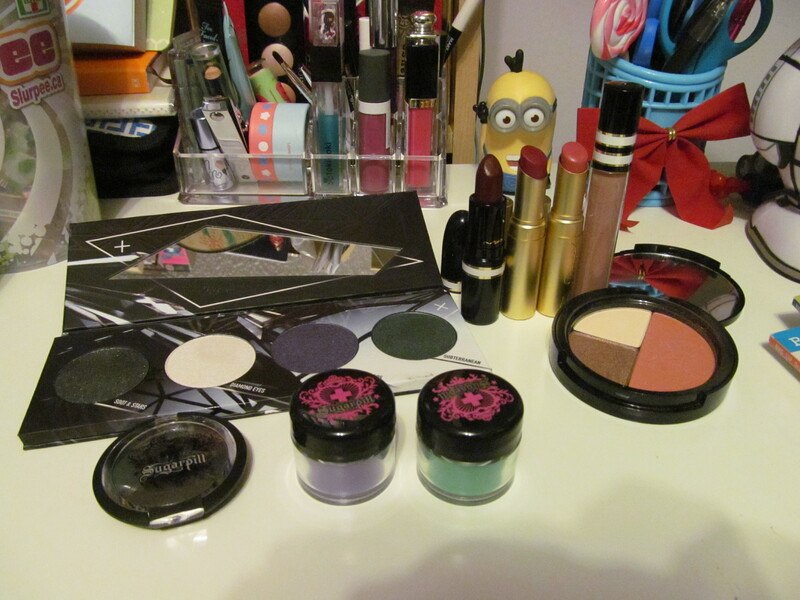 From MAC I purchased a duo compact and an eyeshadow for a brow duo and I also got the Violet lip bag which contained a lipliner (Vino), lipstick (Dark Deed) and lipgloss (Art of Seduction). 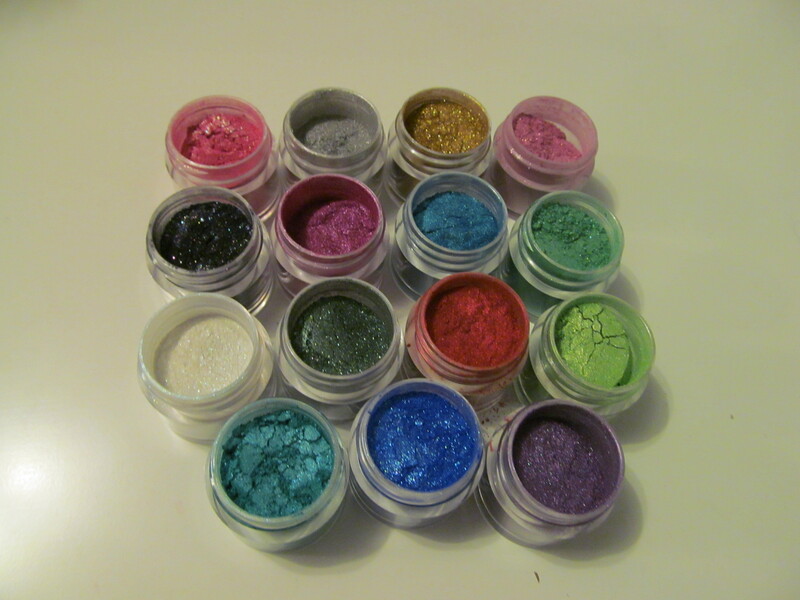 So from the online orders what I ordered from Sugarpill Cosmetics is Bulletproof eyeshadow (who can’t get enough black eyeshadows? 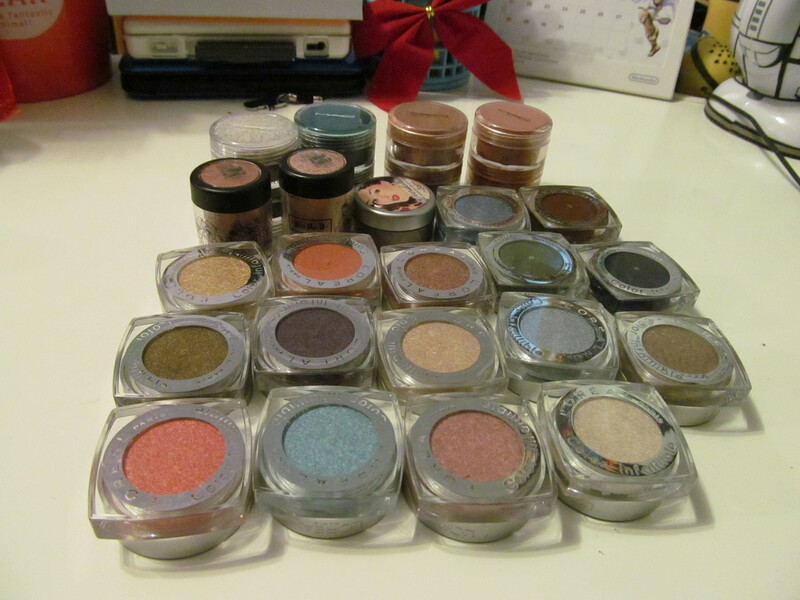 ), Tipsy and Weekender loose eyeshadow (the only pigments I’m missing for a complete Sugarpill collection), and of course the Cold Chemistry palette (this is a must have of course haven’t you seen the palette gorgeous!). From Sephora’s VIB Sale I picked up the Too Faced All I want for Christmas set and in the photos am missing the eyeliner, mascara and eyeshadow primer. From Geek Chic Cosmetics I ordered a few things it’s been a while since I ordered from them but they had released a new collection and I wanted to try some lippies this time around. So I ordered the whole 8-piece Fellowship collection (LOTR related of course I couldn’t say no); Doll Cheeks Blush (Nerdgasm is one of my favorites); lipsticks in My little Pwny, Crysalis, Lipstick of the Shifting Sands, and Once Bitten; Geek Gloss in Health Potion, Benevolent, and Banished. I won’t wear Banished that much but when I review these item it will be epic. 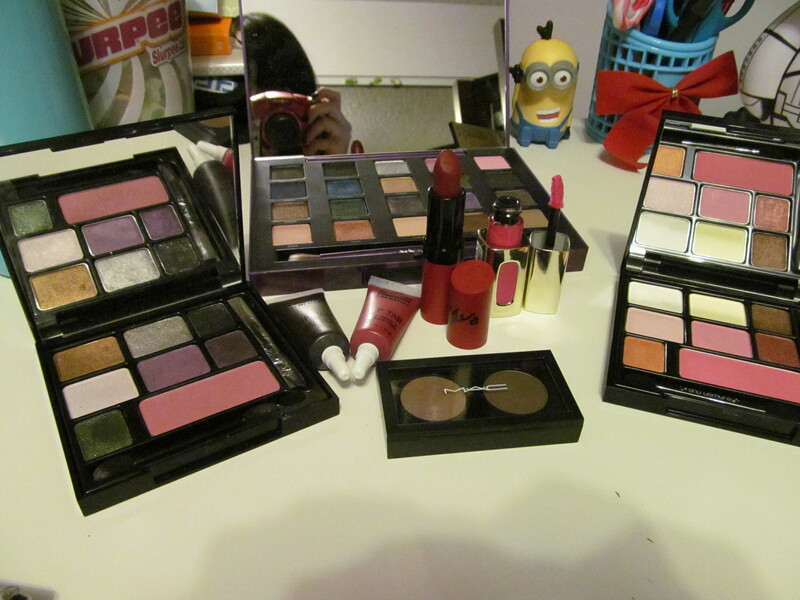 Holiday Gifts from ELF (they all came in sets and stuff) and purchased for myself is a few new things from the drugstores (L’Oreal and Rimmel). Face masks = haven’t used them very much in the past 3 months… You’d think with exams and studying that I would just put on a mask and continue to study but I haven’t actually used any sheet masks this month. I just used a clay one this month because my skin has been acting up. I will be trying to use up my stash much more this year. So after this posts up comes my resolutions for next year and I’ll let you know then what my plans are for purchasing new makeup and stuff like that. And can I say HOLY WALL OF TEXT!! Hello everyone! Today’s post is the lipgloss edition of the beauty stash and despite not using lipgloss on a daily basis I have a lot of them. 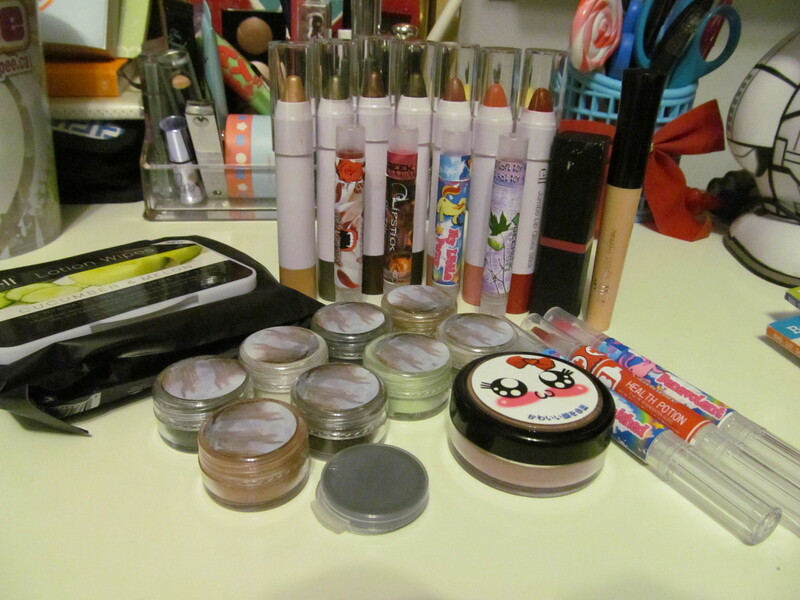 Whew, not as much as lipsticks but still more than I would actually use in my lifetime. Hello everyone! More goodies today. 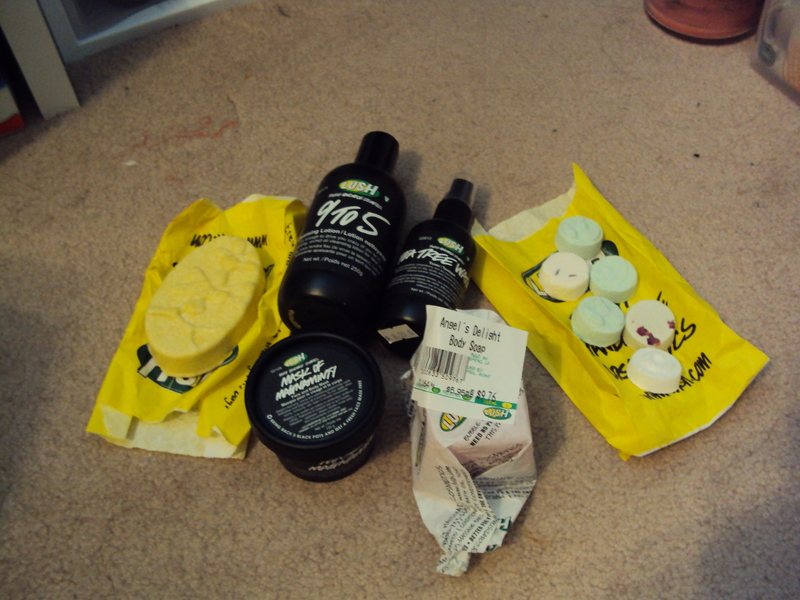 I went to Lush yesterday and thought that I would show you what I got from there. I used to be a LUSH junkie but stopped because it got a bit expensive… kinda how my obsession with Bath & Body Works is waning right now… Anyways, I also go my order from Geek Chic Cosmetics in and reviews+swatches will be coming in the next few days. 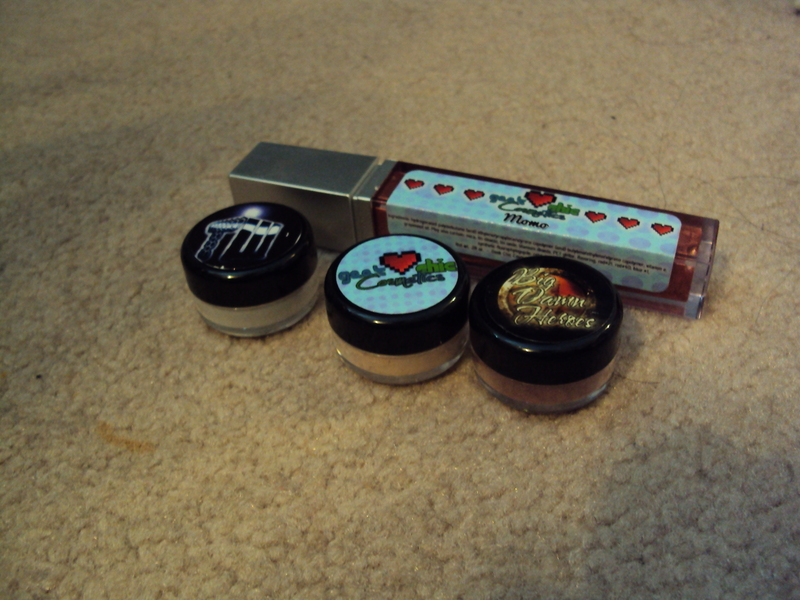 Eyeshadows from left to right are Don’t Blink (Timey Wimey/Doctor Who), Newb (Single Player), Ambassador (Big Damn Heroes/Firefly that didn’t happen). This includes an Each Peach massage bar, Mask of Magniminty, Angel’s Delight soap, 9 to 5 cleanser, small Tea Tree toner, and some toner tabs (which include Dream Steam, Token to the Gods x4, Vitamin C, Tea Tree x2, and Moon&Sun). 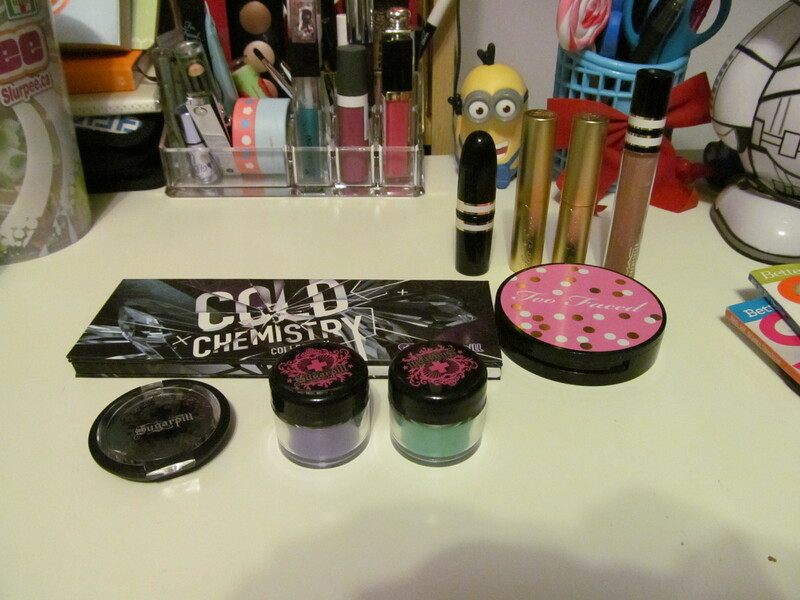 I can’t wait to start using these products and testing them out.